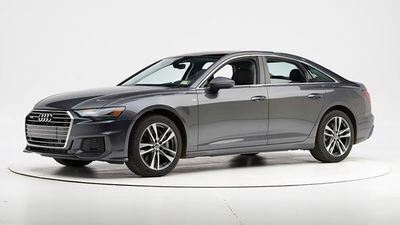 ARLINGTON, Va. — The Audi A6, a large luxury car, and the Audi Q8, a new large SUV, each qualify for a 2019 safety award from the Insurance Institute for Highway Safety when equipped with specific headlights. The A6 qualifies for the highest designation of Top Safety Pick+, while the Q8 earns the Top Safety Pick award. The A6 is available with three headlight options, two of which earn good ratings in IIHS evaluations. Both good-rated options, which come on the Premium Plus and Prestige trims, make use of high-beam assist, a system that automatically switches between high beams and low beams, depending on the presence of other vehicles. The A6's base headlight option earns only a marginal rating. 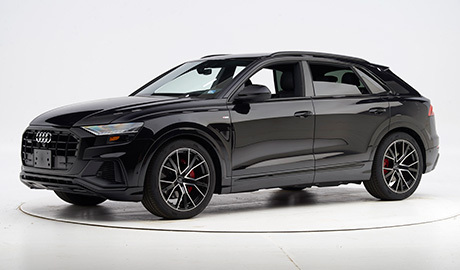 The Q8's best-rated headlights — LED projectors with high-beam assist — come on the Prestige trim or as an option on the Premium Plus trim and earn an acceptable rating in IIHS tests. A good headlight rating would have elevated the Q8 to a Top Safety Pick+. The Q8's base headlights earn a poor rating, due largely to excessive glare from the low beams. The first-tier "plus" award requires a good passenger-side rating and a good headlight rating.